Welcome to Noah’s Ark; The Friendly Swim. Celebrating non-sexual clothes free swimming. If it’s your first visit to this website, “Hello”. Please take a little time to browse our pages to discover a little bit of what we are about and, in the wider sense, what naturism is all about too. We hold regular WEEKLY (except over the Christmas/New Year period) Sunday evening (4:15pm - 6:15pm) naturist Swim and Sauna sessions at Sports Direct in Ewell in Surrey. We are here to provide a warm, safe, family friendly environment to enjoy a swim, have a sauna, dispel those aches and pains in the steam room or even work out in the fully equipped gym. All of this, we enjoy in the way that nature intended. We also have the use of a sun bed at an extra cost. Please ask at the desk when you arrive. We would love you to join us, whether you have been a naturist all your life or want to try, for the first time, that unique feeling of freedom that swimming or exercising without clothes gives you. If you have never swum without clothes, you have definitely missed one of life's pleasures. We welcome all naturists young or old. At only £5.00 per member and £8.00 for non-members per evening, we believe we offer extremely good value for money. Those prices are per adult. Please check the "What's on this week and next" section, below, for all exercise class dates and please note that we do not have swim sessions over the Christmas period . Please e-mail noahsarknaturist@live.co.uk but, IF YOU WANT TO VISIT US FOR THE FIRST TIME, PLEASE PHONE JON ON 07940 881 100 The gate MAY be shut upon your arrival, but you can press the buzzer to the right of the gate. Someone will then let you in. Should you find any broken links on this site, please let us know. While Helen is indisposed, we have arranged for Jonathan to lead his own fitness classes. Keep an eye on the "Whats on This Week and Next" section on this page to see when he is booked. Please note that you will need to give Jon a call on 07940 881 100 if you've not visited us before. 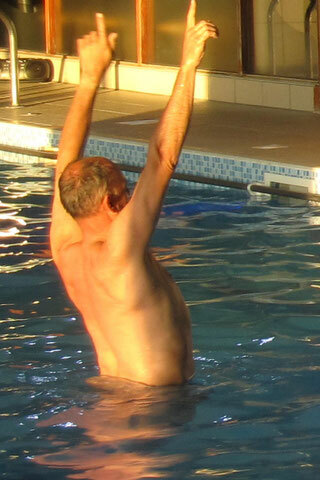 In addition to the regular swim sessions, we also have frequent aqua-aerobics sessions throughout the year. The dates for these sessions can be seen at the top of this page in the "What's on this week and next" area. A recent addition to our extensive programme of extra activities at our sessions at Ruxley Lane is the opportunity to try your skills at life drawing. We do not expect anyone to be an expert with the pencil and do not offer any specific instruction on how to turn yourself into a modern day Leonardo DaVinci. We do, however, give you the pencils, paper and a board to put it on. The most important thing we provide is someone to draw with willing volunteers from the group. Good life drawing, as with any drawing or art in general, can only improve with practice so, even if you've never picked up a pencil since your school days why not have a go and see how you improve over time. The nearest railway stations are at Tolworth or Stoneleigh. From there there is a 20min walk to Sports Direct from either station. Alternatively, you can catch a 406 bus near to both stations which will drop you at the junction of Ruxley Lane/Kingston Road. All members are invited to check the members page for past issues of our "In Touch" newsletter, information on the club visits and a few pictures from the archive. You will need the log in password which you can get from David or Malcolm or see your membership card.